Thanks to a gift from my mom (thanks!) my dreams of picking sweet cherries off our own trees might be a reality next year. 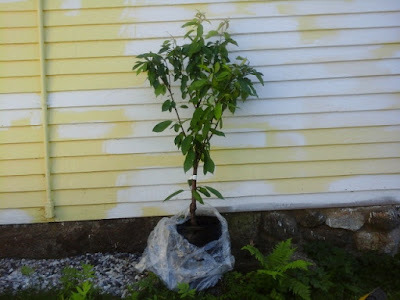 These two cherry trees will be the center of attention in the spring when they bloom on this small slope near the house. my poor picture taking barely caught the other tree on the far left but its there. Two varieties are required for pollinating. these are "Stella" and "Bing". 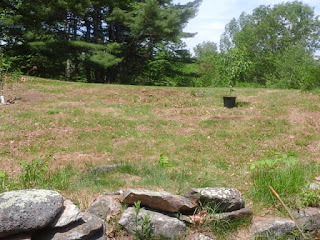 The plan is to clear and mulch this hillside and plant a variety of blooming perennials and maybe some fruit bushes.